(Awa Press, 2012), 152pp. 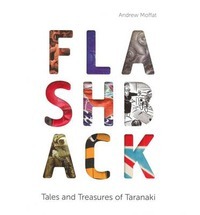 $35; Flashback: Tales and Treasures of Taranaki, by Andrew Moffat, (Huia Publishers, 2012), 321 pp., NZ$55. In 2013, a museum looks like an increasingly strange idea. Get together various collections of still, silent objects. These may not be rare or even attractive. Some were once living creatures but are now dead; others were once useful but no longer have a purpose. Put them into a special building where they can be set up in large rooms on mostly still, silent display to the general public. Doesn’t sound much like the twenty-first century, does it? Today, up-to-date museums may offer plenty of all-singing, all-dancing computer-generated illusions, but Hollywood always does it better. The museum’s real claim to our attention is simple: what its staff so carefully store, study, catalogue and present to us is not a simulacrum or a hologram, but the real thing. This real thing has unique and remarkable connections to the otherwise unreachable foreign country of the past, or the seemingly familiar but still barely known country we now live in — and off. Faced with our uncomprehending, tech-fed, impatient gaze, the curator’s game is to make these objects and their connections spring to life. And it’s a game still played mostly with words. Brian Gill has been playing it longer than most. The curator of land vertebrates — more precisely, ‘birds, reptiles, amphibians, and mammals other than whales’ – at Auckland Museum, he has published books on New Zealand’s extinct and unique birds, and its frogs and reptiles. The Owl that Fell from the Sky: Stories of a Museum Curator is a new departure. It focuses on the collections he tends, the natural world they represent, and the people who gather and use them. To Gill, such stigmatisation could not be more wrong-headed. He quotes the British palaeontologist Richard Fortey: ‘The [taxonomic] catalogue…happens to be the description of what four billion years of life’s history has achieved, and its contents are a measure of the health of the planet. Isn’t that enough?’ In this book Gill sets out to demonstrate, in the most engaging way possible, why Fortey is right and the scoffers are wrong. He begins with the origins of the museum in cabinets of curiosities, such as the one John Tradescant exhibited in South London in 1626. As it happens, I already knew about this from Gillian Tindall’s remarkable book on Wenceslaus Holler, The Man Who Drew London. Holler knew Tradescant, drew his portrait, and was involved in the tangled wrangles over the collection after his friend’s death. As Gill notes, the creation of public collections was ‘a great innovation’, keeping collections both safe and accessible and enabling their curators and users to ‘generate new knowledge’. Gill goes on to explain, in a sequence of quirky, deadpan, finely-wrought stories, some of the extremely curious connections between the remains of dead creatures, the world they and their collectors come from, and our own times. The pursuit of natural history inevitably involves a great deal of social history, and international history at that — museums were interconnected around the world long before the internet. The Kaikoura moa egg in Gill’s first story — the largest ever found — was taken from its nest around 700 years ago, skilfully turned into a prized container, and later lay in the earth alongside someone closely connected to it for around 500 years, until it was accidentally unearthed in 1857. For the next 100 years it travelled the world, miraculously surviving almost intact, and finally returned to its homeland in 1966. Gill leads us on to meet Jammit the Okarito kiwi, Willie Cheeseman’s reef heron, the Duke of Genoa’s black-thighed falconet, Charles Adams’ orang-utan, Captain Cook’s tortoise, and Rajah the elephant. As a child, I rode on one of his successors at Auckland Zoo, and I remember his impressive stuffed presence in the museum: he stood there for fifty-eight years, and now he’s back. But Gill also has distinctly human tales of intense rivalries, shifting priorities and dedicated achievements, all of them imbued with the author’s remarkable power to hold an audience like a latter-day Ancient Mariner (and yes, albatrosses figure here too). Why do I like this book so much? It’s skilfully written, constantly enlightening and inherently interesting, but there’s more to it than that. I think it’s something to do with the quiet, unassuming world of dedicated, meticulous scholarship to which Gill belongs. I remember once editing a book about the long slow shifts and forces that have formed our landscape. My personal life was in some turmoil at the time, and it was inexpressibly comforting to read about phenomena that had absolutely nothing to do with human passions or prejudices, and to grasp that our entire existence on earth has taken place in what geologists define as a short inter-glacial period. I got something of the same sense of comfort from Gill’s book — which is, by the way, unusually finely produced and a pleasure to handle and read. Human beings have had and continue to have an enormous and repeatedly destructive impact on Earth’s other inhabitants, without even knowing who these neighbours are; but as Gill insists, the painstaking work of natural history helps us ‘understand life on Earth in all its exuberant diversity – and understanding nature is a crucial step towards protecting it’. And, ultimately, ourselves. While Gill’s book can be devoured whole, Moffat’s definitely needs to be nibbled at. It’s a sumptuously published softback, with magnificent illustrations and a great deal of white space, but the design has one annoying aspect: the main text is set in a very light, almost grey sans serif face which is difficult to read. These two factors, combined with the time pressures of reviewing, made the book more difficult than he intended to digest — especially as he has chosen not to arrange these stories chronologically. So he begins with a controversial New Zealand Cross from the Taranaki Wars, moves on to the Swanndri, invented in 1913, returns to early nineteenth century carvings, leaps ahead again to a 1916 town plan, and jumps back to a revolver owned by a ‘staunch friendly native’ who fought and scouted for the Pakeha side. But read enough of these oddly assorted stories, and a fascinating series of interconnections starts to appear. Parihaka, for example, figures in five different places, most strikingly in the story about one of the twelve kahu or capes which were made to be worn, very unusually, by women at the tangihanga of peace prophet Tohu Kakahi. There is no shying away from controversy, either. The 1850s daguerreotype of the Barrett sisters, which I know well from the time I spent working at Te Papa, gives rise to an intriguing ‘fresh reading’ of what it may or may not represent. And a 1963 cartoon about the lack of an airport for New Plymouth leads into an account of how the airport was built on the site of Puketapu Pa, despite it being, as officials warned at the time, ‘the burial ground of chieftains and…one of the oldest and most sacred historical spots on the Taranaki coast’. The protests of nineteen owners were disregarded. Moffat has chosen his objects and constructed his stories with great skill. I greatly admired the way he is able to begin with something which is not always easily recognisable as significant or appealing, and then fan out his narrative to encompass broad, deep reaches of history. Through these selected items and their complex connections, he builds up a rich unfolding picture of Taranaki from the time before Europeans arrived to the present, fully achieving his aim of conveying ‘the colour and depth often glossed over by grand narratives or brief, sometimes glib, exhibition labels’. What he has come up with here is indeed ‘the stuff of real life, and history, about which people should know more’, and these neatly potted histories cater for a wide range of tastes. But blokeish interests do seem to predominate, and comparatively few named women appear in their own right. When they do, often a good deal less seems to be known or canvassed about them (or their objects) than about the men. Moffat’s ‘love of a good quote’, too, is more easily satisfied by stories featuring men rather than women, who for so long were not supposed to draw any kind of public attention to themselves beyond a very narrow sphere. The absence of any close attention to the complexities of gender relations contrasts tellingly with the nuanced treatment of race relations. One of the saddest personal stories here, that of Blanche Halcombe, has remarkable links back to Brian Gill’s book. Her grandfather, William Swainson, had been a notable natural history collector before emigrating to Taranaki. Like him, Blanche was a ‘passionate nature lover…happiest when specimen hunting’. But a swathe of untimely deaths – of her new husband (Swainson’s grandson), her brother, her father, and her mother – ‘appears to have set off a gradual mental and physical decline’. She became ‘increasingly reclusive’, barricading herself into her New Plymouth home surrounded by her now enormous collection. When the house caught fire in 1961, there was no escape. Taranaki Museum salvaged what it could from the sodden ruins. Among the rescued items were twenty-five rare and precious ‘study-skins’, as Brian Gill calls them, of birds collected almost 200 years ago by Blanche’s grandfather. Two of them are stretched out across the page, and the story is introduced by the beautiful head and black-feathered eye of the golden oriole. But there is no photograph of William, or of Blanche — I assume that this is because none exist. Taranaki people should enjoy and appreciate this book very much, and it should lead them to think more deeply and widely about their own and their region’s history. Both these books will, I hope, draw everyone back to the superb museums and dedicated staff they implicitly celebrate, and help us all to look at the remarkable real things in their collections much more intently. ANNE ELSE is a writer, cultural historian and freelance editor. Her most recent book is The Colour of Food: A Memoir of Life, Love and Dinner, published in e-book format by Awa Press.